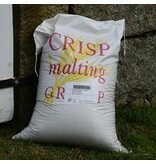 Crisp Gleneagles Maris Otter is an English, ale-style malt made from the famous Maris Otter barley variety and malted in a traditional floor-malting facility. English Maris Otter is recognized worldwide as the benchmark barley for the best ale malt. And the classic floor-malting process is known to produce base malts with full, rich character. The low protein content and high degree of modification are considered ideal by expert ale-brewers, and are very forgiving to the novice when mashed. A classic, high-quality choice for English ales, Maris Otter is also used as a base malt for continental and American ales, and occasionally lagers.